sachi products are hand-made using authentic Japanese materials. Recycled and repurposed materials are used wherever possible. Want to make your own? You can purchase many of the materials we use here. This Japanese crepe fabric is made using techniques dating back to at least the sixteenth century. Two types of silk thread are woven alternately and twisted in different directions to create soft wrinkes (shibo in Japanese). The result is a fabric that is both sumptous and gentle in appearance, and truly delightful to touch and hold. Chirimen is traditionally used in fine kimono making, but is given new life in craft items. In Kyoto, Japan's ancient capital, there is a Chirimen Craft Museum and several retail stores dedicated to items made from chirimen. 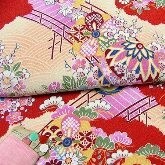 With sachi crafts we offer the same gorgeous crafts at a fraction of the Kyoto price! Chiyogami or yuzen paper features highly decorative, repetitive patterns silkscreeened onto fine quality paper and often embellished with gold. Said to have been made originally by provincial paper-makers as interior decoration for farm houses in feudal Japan, chiyogami patterns were inspired by the fashionable kimonos the papermakers had seen in cities such as Kyoto. 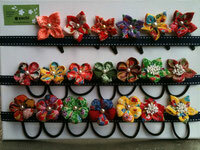 Many are based on traditional motifs from the natural world such as blossoms, birds and waves. 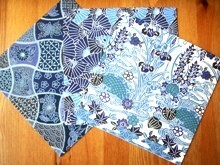 We also use aizome paper, shown below left, which is dyed using traditional Japanese indigo. sachi participates in several markets around Melbourne and central Victoria. Click here to see our upcoming market dates.